* The boot should complete. * Shutdown, and boot again, expecting degraded state. * Shutdown, reconnect disconnected drive, and boot again. * The boot should complete, add the device to the array, the array should be resyncing, and results with system with array in-sync, just like at the beginning of the testcase. * Systems may continue to fail to boot degraded. mdadm does not attempt to start partial md devices (incremental assembly) during initramfs and can cause system to fail to initramfs prompt if rootfs on md. This is fixed in 16.10 and Zesty, but I'm leaving the task open so the bug doesn't disappear from some LP searches. Dimitri - Do you have any plans to get this fixed in Xenial? Will there be any backport patch for Ubuntu 16.04.2? Just tested this out yesterday and Ubuntu 16.04.2 with latest update still could not boot secondary drive. My test was done on Linux mdadm RAID1 with LVM. (/dev/md0 for /boot xfs, and /dev/md1 for LVM with /root xfs and swap). - Fix UUID= grep for configured RAIDs to be case insensitive. - Drop, no longer in use. Fixes my degraded raid boot issues. System boots up fine after this PPA is applied. I accepted the package from the queue to -proposed but since it was a sync I couldn't do it through the proper tooling (I think I need to get educated how to do it properly for synces?). Anyway, this means that there was no auto-release message. Please install the package from xenial-proposed, test it and mark the bug as verification-done as with any other SRU bug. Hi Lukasz and Dragan, I just received confirmation from a customer that the propsed package also fixed the issue on their ibm power environment as well. This was using the ca-train-ppa-service ppa however, so I'll check again using the proper proposed repository package. Was the "check again using the proper proposed repository package" made? sync from bileti ppa, and thus it is identical binaries. retested without ppa, and just with proposed using 3.3-2ubuntu7.2. I have also validated the proposed package on my reproducer sandbox, and it worked correctly. Still awaiting feedback from customer with ppc64le system, as soon as I hear back I will let you know. The verification of the Stable Release Update for mdadm has completed successfully and the package has now been released to -updates. Subsequently, the Ubuntu Stable Release Updates Team is being unsubscribed and will not receive messages about this bug report. In the event that you encounter a regression using the package from -updates please report a new bug using ubuntu-bug and tag the bug report regression-update so we can easily find any regressions. I just made a fresh install from ubuntu-16.04.2-server-amd64.iso, updated everything, and tested to boot without one disk. It failed. See the attachment for my RAID configuration. > the attachment for my RAID configuration. Please open new a new bug report, instead of piling onto an unrelated report. only after which the volume groups will be detected. I do not see anything degraded in your case at all. > only after which the volume groups will be detected. Why do you lie? You didn't even look what I reported? The first screenshot clearly shows that the boot fails before password is even asked. The second screenshot shows that the password is asked when I attached the drive again. >> only after which the volume groups will be detected. > Why do you lie? You didn't even look what I reported? File a new bug report with text logs.... not photographs / screenshots. > The first screenshot clearly shows that the boot fails before password is even asked. > The second screenshot shows that the password is asked when I attached the drive again. > File a new bug report with text logs.... not photographs / screenshots. And this is a perfect example why Ubuntu is a piece of garbage. Someone reports a serious issue with Ubuntu, but the whole bug gets dismissed, because the reports are in a "wrong" format. How do you even get early boot logs out of Ubuntu when the boot fails? You didn't even mention that. Is there some way to contact professionals at Canonical instead of these amateur wise asses on this platform? > If you are unable to capture a log file, a digital photo will work just as well. Hopefully someone competent will see these messages at some point. 1 virtual disk containing the OS. 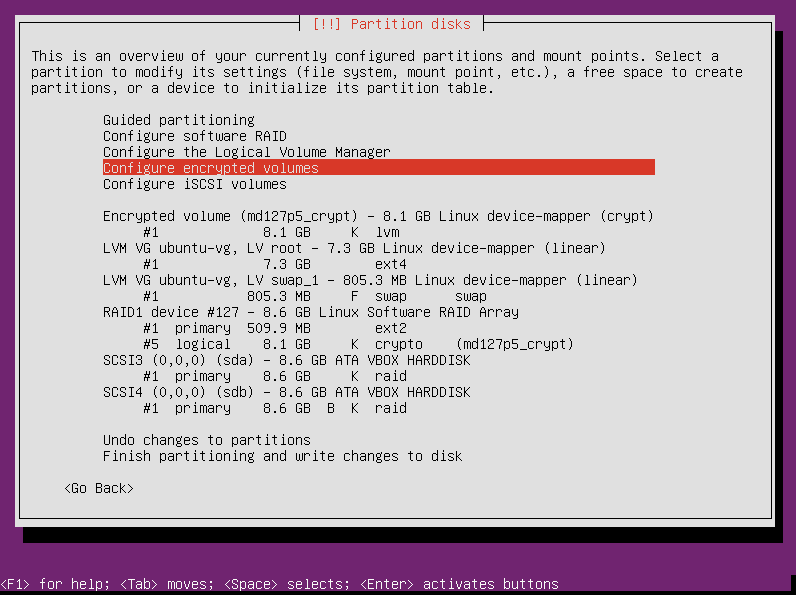 2 virtual disks running as a RAID 1. Whenever I disconnect one of the RAID disks, Xubuntu cannot boot. After that, Xubuntu can boot properly with the degraded RAID. Is this bug report abandoned? And why the bug is assigned to Dimitri John Ledkov? He is obviously incompetent. In comment number 18 he even claimed that photographs and screenshots aren't acceptable in bug reports even though Ubuntu's website clearly states otherwise. Hey there kids, this bug still appears to be relevant for 16.04. My /dev/sda died today and I'm prepping to replace the disk. I note that the answer here https://askubuntu.com/a/798213/185653 notes the missing file and it's still missing. I haven't tried a reboot as I'm waiting for the monthly check to complete on the other array but I've added in that script and rebuilt my initramfs and installed grub on sdb. Will let folks know how I get on. The tone and comments in this bug from some reporters and others is... poor. I would have hoped for better. This did not work but I'm not clear why. It might have been be messing up the grub install.